Car 1043 is a wood and steel composite, double-truck, double-end, closed car with a deck-roof and longitudinal seating. It has 12 windows and closed platforms. In New York this type of car is referred to as a “box car”. San Diego Electric Railway 1043 was built by the J. G. Brill Company in 1908 for Metropolitan Street Railway Company of New York City as their 191, part of series 156 to 230. The Metropolitan Railways failed that same year and was re-organized as New York Railways. The paint scheme was slightly changed from green to green and cream colors, but the car was not renumbered. When this car was built it was intended for use in Manhattan on the conduit system and was not equipped with any roof mounted trolley equipment. It did not come with any headlights either, apparently depending of streetlights to provide necessary illumination for nighttime operation. 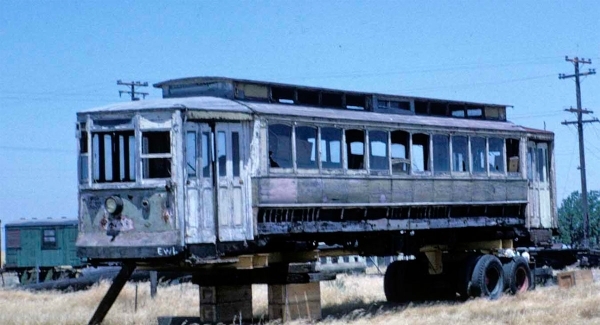 Surviving records show that this car was regularly operated on New York and Harlem’s Forth and Madison Avenue line. In 1924 the car was sold to the Third Avenue Railway System, repainted into the red and cream paint scheme, and renumbered to 436 (part of series 401 to 475). There were no other changes at this time. During the car’s first rebuilding it was wired for overhead operation. TARS added treadle doors for one-man operation, foot operated brakes, and headlights. This car may have been used in the Bronx, but was never lettered for the Union Railway. The car was sold to San Diego in June1942 as part of the War effort along with 19 other cars of the same class becoming series 1031 to 1050. These cars were retired at the end of the War. Car 1043 is the only surviving example of this class. It was acquired by Eldon Lucy and stored in Sacramento until it was moved to the Museum in June 1964. It was acquired by the Museum in November 1974. Owners: San Diego Electric Railway 1043. Metropolitan Street Railway 191. New York Railways 191. Third Avenue Railway System 436. Technical Data: Wood and steel composite construction. Built by, J. G. Brill Company in Philadelphia in 1908. Seats, 44 passengers. Weight, 45,000 pounds. Trucks: Brill 39-E2, trucks are set up for conduit plows. Wheels: motor axle, 34”; pony wheel, 21”. Axle. Journals, 4 1/4 X 8 on motor axles and 3 3/4 X 7 on pony axle. Traction motors, 2-70 horsepower @ 600 VDC, outside hung. Air Brake Equipment: Westinghouse Traction Brake. Motorman’s valve, foot operated, self lapping. Emergency Valve, D-4. Brake cylinder. Air compressor, General Electric CP-27. Dimensions: Width. Length over buffers, 46’ 11”. Height. Truck centers. Truck wheelbase, 58”. Propulsion Equipment: General Electric type K. Controllers, K-37. Traction motors, GE 210. Control switch. Power resistors. Misc Data: Heaters. Trolley wheel. Trolley base. Current Condition: This car is in poor condition and is an incomplete restoration. It was received by the Museum in this condition. Proposed Future Treatment: This car needs to be restored to its San Diego appearance.